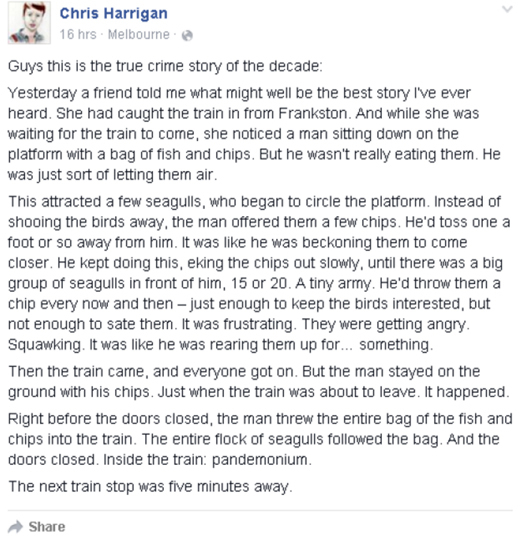 Video footage of the bizarre pastime has emerged since news of the Frankston Line Seagull Troll. Last night Johnny Vaughan discussed the Frankston Seagull Troll on his show, following an alleged event that occurred at Franston in Melbourne, Australia. While there still isn't definitive proof of whether the story dubbed the "week's best internet myth" really happened, it seems that seagull-based pranks definitely do. These clips posted on YouTube prove there's nothing new about pranking members of the unsuspecting public with seagulls, however silly it is.